Mouse: If you close your eyes, it almost feels like you’re eating runny eggs. Apoc: Yeah, or a bowl of snot. Mouse: Do you know what it really reminds me of? Tasty Wheat. Did you ever eat Tasty Wheat? Switch: No, but technically, neither did you. There are certain things that you should really taste at least once, but are usually hard to get a hold of to taste, like let’s say top quality caviar, or kobe beef, Peter Luger’s steaks . Other things, like oysters, haggis, Gray Papaya and Nathans hot dogs, high quality sashimi and other notable foods, that might be hard to obtain everywhere, but are still more or less affordable. There are whole lists of “things to try at least once” out there. Then there’s a category of items that were eaten in the olden times, but are not considered acceptable food anymore: whale meat, horse meat and other intelligent and/or exotic animal meats. I’ve had whale steaks back in the day, whale meat was widely available in the Soviet Union, as well as horse sausage. Since I ate a lot of hot dogs , I am sure I had my share of cats, dogs and pigeons. 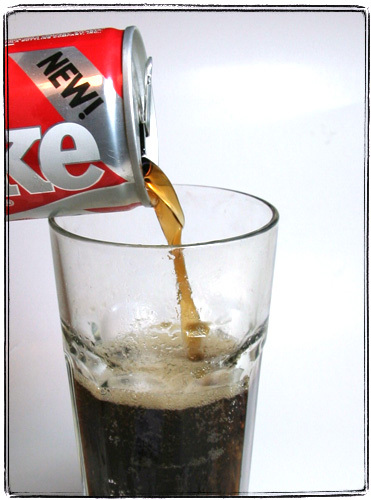 I was always especially interested in one soft drink that I never got a chance to taste: the “New Coke.” The myth-shrouded beverage seemed to be out of reach for me, until thanks to the twin wonders that are packrats and eBay, I got my own unopened can or genuine New Coke. That’s a reason for the new installment of Gastronomic Adventures, of course. I chilled the $10+shipping can of soda and photographed it in all its glory. Look, just look at it! I was expecting the can, that is at least 13 years old (in 1992 New Coke was renamed Coke II) to be completely devoid of carbonation. I was ready for a foul smell, discolored soda, etc. To my surprise, the carbonation was mostly normal and the coke smelled just fine. I kind of knew what to expect — in theory New Coke has the same formulation as Diet Coke, except with sugar instead of aspartame, and should taste similarly to Diet Coke With Splenda. I knew that New Coke was supposed to be sweeter than Coca Cola Classic. Of course, taste tests are a tricky thing. I am pretty sure I would have a lot of trouble telling Pepsi from Coke from Mexican Coke (the one in glass bottles and sweetened with cane sugar) from Diet Coke (if it’s with ice). 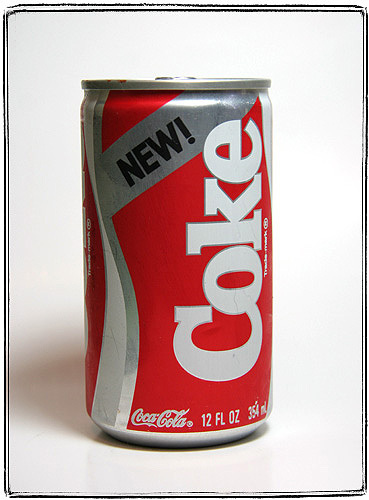 In any case, decade old New Coke _did_ taste a bit like Diet Coke With Splenda. It was not as sweet as I expected, and had that weird little aftertaste that I always associated with the Splenda Coke. 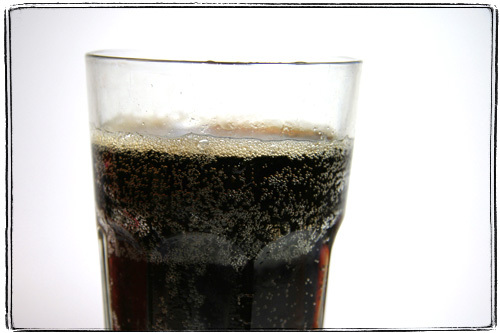 I think in Diet Coke it’s masked by the aspartame and in Classic by higher acidity. I seem to have not suffered any stomach upset or anything of that matter. Upsettingly I did not acquire any noticeable superpowers, except the ability to say that I’ve tasted the New Coke. P.S. Does anybody know how to obtain some surströmming online or in New York? P.P.S. I Know about hufu. I think it’s a hoax. Next PostNext Avast, Me Hearties!